It’s a great season for fungi – we’ve had a warm summer, followed by a damp, mild autumn. These specimens, ranging from the magnificent to the seriously weird, were all photographed in the woodlands of Perthshire last week, under a mixture of birch, beech and oak trees, and some of the tallest Douglas firs I’ve ever seen. The river is the Braan, which runs through a wooded gorge to the south-west of Dunkeld. I’m no expert on fungi so it would be silly to try and name them – but if you can identify any, please feel free to add your comments below! I’ll mix in a couple of scenic shots and other details to give a sense of the wonderful landscape. All photos copyright © Colin Woolf. 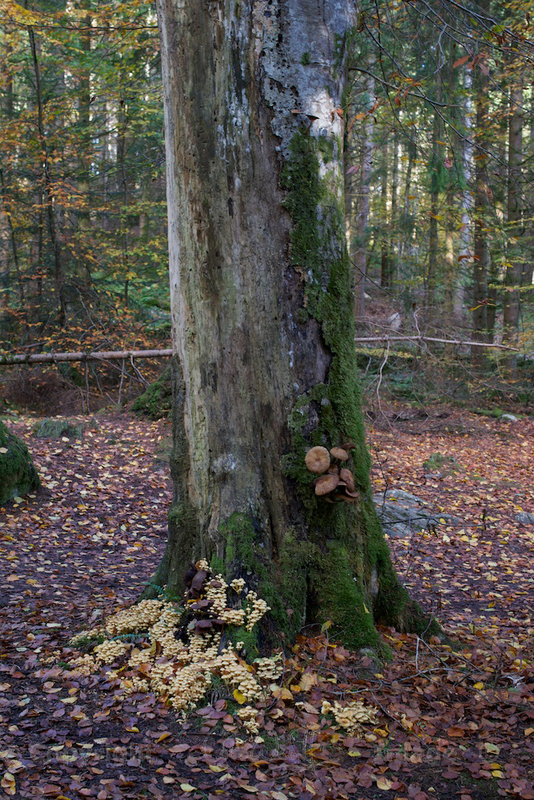 Taken in the Hermitage woods, Perthshire. I believe you didn’t touch them all, right? 🙂 No, Cornel, we didn’t touch any of them! It’s OK! I don’t know enough about fungi to be confident enough about touching them – they can even confuse the experts. Thank you for your concern though! These are wonderful pictures again. I really must explore this area next year. Thank you, Ash! The whole of Perthshire is beautiful – I don’t think we’ve even explored half of it. It’s well worth a visit! Lovely fungi photos, and what a diversity you found. Thank you, Vicky! I’m sure we could have found just as many again – it was a wonderful spot for this kind of photography. That’s very true! I think that’s one of the principles of meditation, so perhaps that is why it’s so therapeutic to enjoy nature and photograph it! Smashing pictures, Jo. The diversity is wonderful, they’re very beguiling, all these fungi. Thank you very much, Lorna! Colin always has good fun finding things like this! If he goes missing I usually find him on his hands and knees somewhere. But yes, there was a great diversity of fungi – I’m sure this is down to the weather this year. Exquisite photography! You have really caught the magic of this wonderful place. (I wish I could take half such lovely pictures!) It is close to us and I was there with my son’s class a few weeks back, revelling in its beauty. I too have been enjoying the variety of fungi in the woods this autumn. Thank you, that’s very kind! We hadn’t been to the Hermitage woods before, and they are magnificent. The trees and the falls were stunning, and I don’t think I’ve ever seen such a wealth of fungi! Gorgeous photos as always! Your pictures are so beautiful. Thank you so much, Tanara! I’m glad you enjoyed them. I recognize the puffball, but none of the others. They are gorgeous, though! They are all amazing in their own way, though some of them do look sinister! I am lost when it comes to identifying fungi – I suspect it would be the study of a lifetime! What a grand variety of exotic life! Yes, it was incredible, Bob – I have no idea how many different species there were, and all in one woodland! LOVELY LOVELY LOVELY LOVELY LOVELY LOVELY! Oh, such a delightful array of images…hanks for sharing these! Thank you very much, Hank! I know you would have loved to check them all out!